In the world of Apple TVs, Rokus Roku 3 Review and Giveaway Roku 3 Review and Giveaway As more content becomes available online, the need for a traditional television subscription may not be enough anymore to justify the costs. If you’re already subscribed to services like Netflix or Hulu Plus, now may... Read More , Fire TVs, and generic Android TV sticks or boxes, is there room for one more? VidOn.me’s AV200 Android Blu-ray box is a $120 option with one unique feature: it supports Blu-ray menu navigation. How useful is this feature and how often will you use it? Does it justify choosing the AV200 over an Apple TV or Amazon’s Fire TV? Let’s take a look. We’ll also be giving this media player away, so be sure to read through the review, then submit your entries to be entered into the drawing. It’s not a very familiar brand, I’ll admit. VidOn.me is affiliated with DVDFab, one of the biggest names in DVD and Blu-ray ripping software. As such, the VidOn.me AV200 player contains DVDFab technology which allows it to support Blu-ray menu navigation — it’s unique and key selling feature. Other than that, the AV200 is pretty much similar to any generic media player running on Android. At $120, the AV200 isn’t exactly cheap. It’s approximately $20 dearer than the Apple TV, as well as Amazon’s Fire TV; as a media player, that’s not a very attractive standpoint. However, neither the Apple TV nor the Fire TV supports Blu-ray menu navigation. In fact, the AV200 is the only media player among the three that’s capable of playing 3D content. If you consume a lot of 3D content, in Blu-ray format, stored on a local device like a USB hard drive, then the AV200 is perhaps the best option for you. The VidOn.me AV200 Android player is a sleek-looking device. At 190 x 124.5 x 45.4 mm, it’s about the size of a novel. With its anodised aluminium case and shiny plastic front panel, it will feel right at home on your entertainment console. It does, however, have a sizeable external vertical antenna, which will prohibit you from storing the AV200 in an enclosed space, especially if you have a cluttered console. Although it bears no resemblance to the low-profile design sported by the Apple TV or Fire TV, I still wouldn’t consider the AV200 bulky at all. Internally, it features pretty modest hardware, which includes an ARM-based Cortex A7 quad-core chip running at 1.3GHz manufactured by AllwinnerTech, PowerVR SGX544 eight-core GPU, 2 gigabytes of DDR3 memory, 8 gigabytes of storage, and 2.4GHz 802.11b/g/n wireless. Out of the box, runs Android 4.2, designed to feel like a media center. As mentioned earlier, the AV200 has a shiny plastic front panel, with a single silver power button. When powered on, a blue LED lights up in the middle of the panel. Around the back, you’ll find the port which holds the enormous antenna, air vents, audio out, microUSB, power, HDMI, LAN, USB, and optical audio output ports. On its left side, there’s yet another USB port as well as a SD card reader. The AV200 ships in a rather mundane-looking white carton box with an infra-red remote controller (although no batteries were provided), power supply, “high speed” HDMI cable (standard not printed) and some documentation to help get you started — illustrating how to power the device and connect to your local wireless network. Notably missing from the package is a user guide. At the time of writing, the AV200 is out of stock from its vendor, and unfortunately, its product page isn’t quite ready for prime time as the user guide and FAQ links seem broken. Setting up the AV200 is a piece of cake. Connect the power cable, attach the HDMI cord, and you’re in business. There’s no pairing involved, no extended setup processes — it simply turns on. VidOn.me AV200 launches and presents with a media center interface upon boot. Navigating the interface is quite simple using the directional buttons on the remote controller. Alternatively, a Mouse Mode is also provided, which is pretty standard with most Android-based TV sticks Rikomagic MK802 IV and MK812A RK3188 Android Smart Mini PC Review and Giveaway Rikomagic MK802 IV and MK812A RK3188 Android Smart Mini PC Review and Giveaway A complete Android system for your TV - not a Chromecast, not an adapter for your phone – no additional hardware required. Android "TV sticks" are mini computers running Android. They have no screen, instead... Read More and boxes (what are Android TV boxes Android TV Boxes: What Are They, And What Can They Do? Android TV Boxes: What Are They, And What Can They Do? Companies like Apple, Roku and Western Digital have already capitalized on this with their set-top boxes, but now a new wave of Android options has hit the market. Typically available for between $60 and $100,... Read More ?). Setting up networking was the first thing on my to-do list. However, using the remote controller to input keystrokes proved to be frustrating. The buttons on the remote controller were much too stiff, and there’s a slight — probably half a second — delay between pressing a button on the remote and the actual on-screen event, which is disorienting. Perhaps I should also point out that my wireless network password wasn’t masked and readily available for everyone to read. The VidOn.me AV200 home screen was designed using a very straight-forward, no-nonsense approach. It provides you with the basic options for which you might want to use the device. Of course, it works like any Android device, so you can dive into the Play Store and install any app you wish. It comes pre-installed with a few popular apps for consuming media, for example, Hulu, Netflix, Pandora, Pinterest, and Spotify. Using the remote controller to navigate the user interface generally works. However, conflicts do happen, and there will be some menu items that the remote controller just can’t seem to reach. That’s when Mouse Mode comes in handy. With Mouse Mode enabled, the directional buttons on the remote are used to move a cursor around the screen. I do have to point out that a single press on the remote controller results in the cursor travelling two paces — it’s not exactly smooth scrolling. At one point, I was pretty annoyed because there were elements that neither the remote controller nor the mouse pointer could get to. The AV200 utilises XBMC to play media files, and that’s no surprise as most Android TV devices depend on XBMC. You can expect to use all of XBMC’s core functions here, there’s really nothing special about this particular installation. To find out more about XBMC, read our guide on setting up XBMC. Of course, in order for the AV200 to work, you’ll need to have local media in any of the common file formats: MKV, MP4, AVI, VOB, TS, WMV, etc. The AV200 can access media from its built-in memory, connected USB hard drives, SD card, or from local network-attached storage devices. Generally, there aren’t any device-specific restrictions on accessibility. As long as XBMC supports the source, you can add it to your library. As I have all of my media stored on a NAS device, I instructed XBMC to search for SMB folders. Disappointingly, it didn’t manage to find my server. After manually adding the network address as a source, XBMC imported the media files and listed them in my library. Despite the bit of manual manipulation, the setting up process was rather painless. At least, I should say it was expected, since all networking-related procedures are bound to face issues. Playback — through WiFi — was horrendous. Despite its large antenna and wireless-N connectivity, I can never seem to get the AV200 to play any of my local media files smoothly when connected to WiFi. One of the test files was a 720p WEB-DL TV episode at around 1.3 gigabytes and I could never get past the endless buffering. After switching to a network cable, the issue was resolved. Still, this is a rather major blow, especially if a wired connection isn’t an option. Playback quality is acceptable — PowerVR SGX544 GPU does the job with decoding 1080p media files pretty well. Although I didn’t have any Blu-ray media files to test, I did play a bunch of 1080p MKV files. Watching movies with the AV200 was smooth, but I did notice a minor glitch: the audio would fall out of sync after seeking or changing chapters. This would happen no matter which file I played. Luckily XBMC has a feature to alter the audio offset, which allowed me to re-synchronise the audio track. Note: after consulting with a representative from VidOn.me, they’ve assured me that the audio sync issue would be fixed in a future firmware update. Like I mentioned, the buttons on the remote controller are much too stiff to use comfortably. Pressing a button lightly doesn’t invoke a response, and sometimes pressing harder doesn’t result in anything either. The buttons also don’t provide the satisfying click found on most modern remote controllers. Instead, it’s stiff and squishy — if that makes sense. Since it communicates through infra-red, the remote controller must establish direct line of sight with the media player. Unfortunately, this means that whenever you’re using the remote controller, you’ll need to lift your arm up and point it towards the media player. In today’s world of Bluetooth and WiFi Direct, that’s pretty much unacceptable. It also means that you can’t have the media player enclosed in a cabinet somewhere, unless you also use an IR blaster to relay the signal. There are quite a few buttons on the controller and without a manual, it’s puzzling to figure out what each button does. I did randomly press on a few of the more mysterious buttons to see if they’d invoke an event on the screen, but nothing happened. Some buttons outright won’t work. For example, the subtitle button brings up the subtitle menu in XBMC, and will run through the list of subtitles, but it will not select an option. There also aren’t any dedicated volume control buttons to be found. Instead, there’s an “audio” button which you’ll need to first select, then use the directional buttons to increase or decrease the volume. Not the most intuitive layout, I must admit. Honestly, I would have preferred a more minimalist approach — perhaps similar to the Boxee’s remote, with a few dedicated and directional buttons on one side, and a keyboard on the other. As grateful as I am that VidOn.me provided a remote controller with the AV200, it couldn’t be harder to use. When using the AV200, it found the performance to be quite sluggish, even while navigating the user interface. There’s probably a half a second delay between the input on the remote controller and the event on screen, but that’s amplified by the sluggishness of the device. The graphical transitions are also slightly jerky, and not as buttery smooth as I’d hoped. Running AnTuTu confirmed my doubts — it return an average result of 11379, which is poorer performing than Samsung Galaxy S3, a smartphone released in 2012. Coupled with the wireless woes I faced during testing, I was left with a bitter experience. 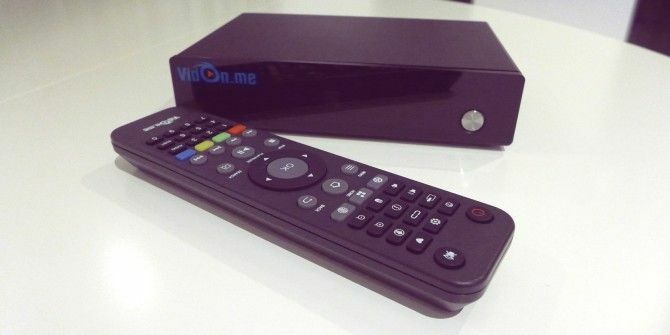 Should You Buy The VidOn.me AV200 Android Media Player? The VidOn.me AV200 media player is by no means perfect. However, it is an entirely capable media player that should be considered. Wireless networking issues aside, the user interface is intuitive, a remote (albeit a confusing one) is provided, and setting up is really easy. The beautiful thing about Android TV boxes is the boundless capabilities — just hop on the Play Store and download any app you wish. If XBMC isn’t working for you, then download another media center application. With Android, you’ll always have options. If only it was $30 cheaper. Congratulations, Darrell Bowman! You would have received an email from jackson@makeuseof.com. Please respond before August 9 to claim your prize. Enquires beyond this date will not be entertained. Explore more about: Home Theater, MakeUseOf Giveaway, Media Player. Two are most important: ease of use and quality. I'd like to say other factors are involved, but honestly price is usually the only one. Stylish to complement my TV . It should be able to support a wide variety of formats. The most important things are the Price-to-performance ratio and ease of use.Also it should support all the common formats I throw at it.Finally the warranty period should be at least 6 months. The ease of set up and operation as well as streaming speed and quality will determine what I buy. Compatibility with as many file extensions as possible. I think that Usability is the biggest factor to me. Does it do what I need it to do? The most important is always price. The quality and easy to operate and friendly user. That it can play all the media I have. The most important factor that determines which media player I use or buy is price. What video formats can it play and the energy it needs. Noise has also to be very low. Price-to-performance ratio. I have to have good balance between those. Also, the warranty is a huge deal for me. I have a Roku 2 XS and it was fine until the warranty ran out (90 days, woohoo...), then it started with all kinds of issues. For me, it's always been speed and reliability. Support For Multiple Formats and to stream. To me the most important factors are flexibility and price. the most important factor in a media player is internet connectivity, can it run Plex, and what other apps or features it may have. Video quality and sound quality is the most important factors for me. The most important factor is Ease -of- Use. Sound quality has to be the best. Only one? In that case, the ability to all the files and sources I want. Good looking/ easy to use software and video quality. Ability to stream in HD without lagging or stuttering. Networking and ease of use. Easy to use! I don't want to have to keep going through the manual every time I want to do something with the video player. Networking compatibility and smooth performance. As long as the player exceeds the tv, then it is perfect. The most important thing for me these days is the method of connection. My TV has reached it's limits. Until I can save up enough for the new one I want, I deal with this sort of thing. I don't have one, have never used one extensively, and, also haven't given it much (if any) thought. So, I'd have to say n/a. Price would be my first followed by quality. Quality, ease of use, and price. The quality of the playback is important to me. Sturdiness (longevity): We don't buy a lot of electronics, so we get things to use for a long time. The devise needs to have decent streaming capabilities and have the latest access to online content. Ease of use as well as compatibility features -- OH and having a remote that's actually packaged with the BluRay player is a feature I appreciate since the last devices I purchased did NOT come with remote (yeah I know how weird right?) I want a Blu Ray player that plays whatever I put into it without me having to struggle or reburn discs I've made at home. The most important factor for me would be a lot of compatible apps that can stream. Is also important that navigation be fast! The most important factor is compatibility with file types. If it is not compatible with the file type my media uses, then the player is useless. Easy network connectivity is a close second. Ease of connecting to the cloud and my network. Quality and capacity of play several types of media. Price, ease of use and reviews! The most important thing is the quality of the recorded image. In general, I look at supported filetypes. I like the idea of being able to play Blu Ray ISO files. MKV is another big plus! Quality, price and user friendly!! Must run the ultimate video formats, to have regular updates, easy use. There are so many devices out there competing with each other that I have to go with "Bang for the buck". In other words, how many and what type of features am I going to get for the price. How comfortable it is to use. being able to view what I wish and not being limited by a certain brand of tech. Price, XBMC, 1080p smooth playback. It should be easy to navigate and can use different app through a different 3rd party. Smooth playback and connection speed are the most important to me. I can fix other issues. I won't lie - the price. A TV would be a great start, price and features. Must support all media formats and be reasonably priced. Must recognize all my movie formats. Support for a variety of media formats is most important to me. The ability to use any market apps for streaming content services. Price and intuitive controls are both important! Price, ease of use, and support for all formats. Having able to play other formats is more than enough reason. The slickness of its interface is a major factor I consider. Price and video quality. I also like customization options. Affordable and can play almost all media formats. First off the price, then specs and quality. The ability to watch and stream what I want, not what the device tells me I can. Ease of use. It has to work and not be a hassle using it. Selection. I have to be able to watch the shows I want and like. The media player should be able to play all formats with any issue. Plus should play any region restricted media as well. It's price and what kind of device and files it supports. Good performance and easy operating inteface. Image quality and video formats. I'm looking for a mediaplayer that has a good price, and is able to stream from my network. The software is important so it can be upgraded to support new codecs. Because it is in the living room it has to be quiet, small and have a slick look. Fast,responsive and supports alot of formats. I'm easy. As long as it has the channels I need, I'm good. Everything, seriously, I like it to run smooth, nice interface, to be speedy etc etc. The most important factors are price, performance and ease of use. You should have mentioned in the review that this VidOn.Me player is also one of the very few Android boxes that can do 1080p 24Hz output on HDMI (most are locked to 60Hz) and HD audio passthrough. It has to be easy to use, but with a nice interface, because i hate the clunky UI some android powered media players have. Ease of use, price and online reviews help me decide on purchases. Have to agree...Plex is a must. Does it have the channels I want and the processor not to take forever to watch them. Most important to me is ram and processor so I can have the smoothest playback possible. I use my LG blu-ray player and Synology NAS via lan.